Don’t miss an absolutely stunning scene! When was the last time you looked up and hoped to see stars? It’s amazing that nowadays people have to travel to specific places to be able to see clear dark skies. Light pollution is usually the culprit, especially if you live in a big city. It is such a big factor that some places have even adopted outdoor lighting regulations or installed materials to block out some light. While you might not have the best view from your back porch, there are still places across the U.S. where you can get a great view of outer space. National parks, for example, preserve some of the darkest skies in the country. It’s even possible to see up to 15,000 stars throughout the night. In a city the most you get is about 500. 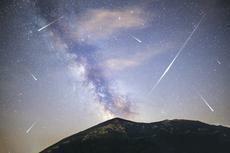 The Orionids, which will peak around October 21, can be visible anywhere on Earth. They can appear all across the sky. The Leonids, which you’ll be able to see around November 17, are also visible around the world, but it may be easier to spot them from the Northern Hemisphere. To be able to see either phenomenon, you need one thing above all – really dark skies.